A little “what if” led to the creation of this super simple Homemade Chai Tea Latte! I can’t remember the first time I had a Chai Tea Latte, but I do know that I was instantly hooked. As a lover of all the super sweet coffee concoctions available, it was nice to have another option! But, it quickly became an expensive indulgence. Those fancy little coffee shop treats, while definitely worthy, were adding up fast. Naturally, I had to figure something else out. I have no idea what goes into a coffee shop Chai Tea Latte, but I was going to figure it out, or something close enough. I bought a box of high quality chai tea bags, thinking I would add milk and sugar to it. When I got home and made the tea, my eye caught a bottle of coffee creamer, and the rest is history. I have never been super picky about coffee creamer. I love it all…as far as taste goes anyway. However, the older I get and the more I learn, I have made a lot of changes with the products I buy. 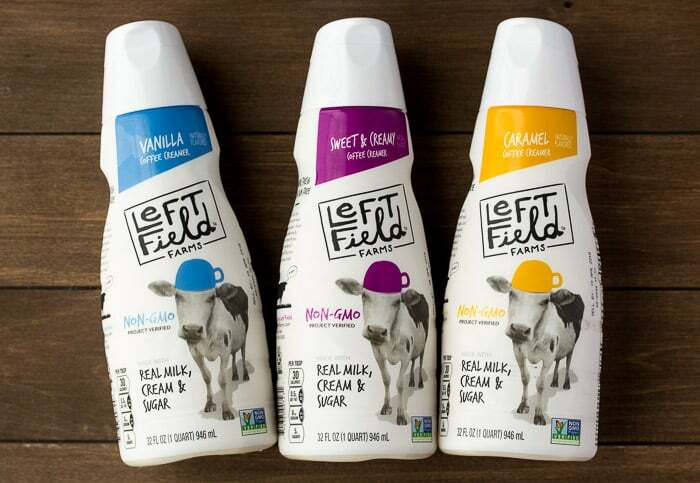 Enter Left Field Farms Coffee Creamer! 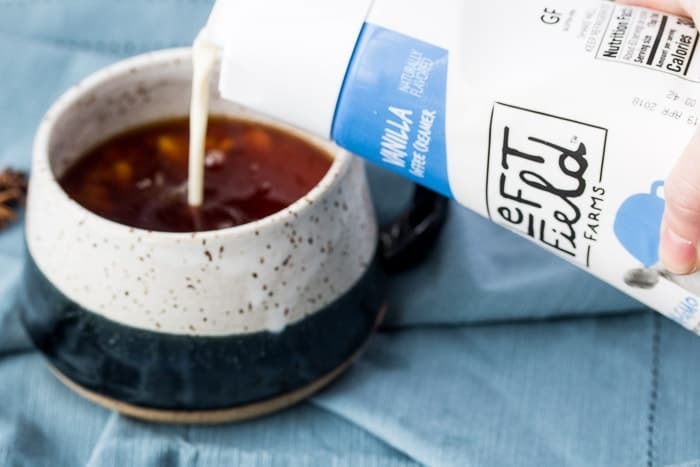 It’s a non-GMO project verified creamer that’s made with real milk, cream, and sugar and does not contain any artificial flavors. 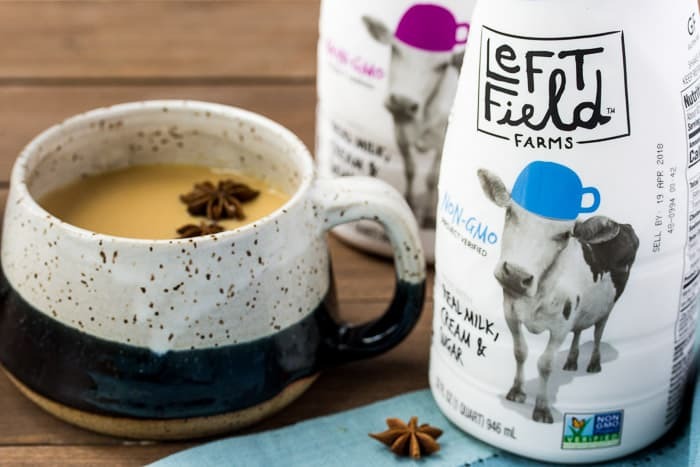 Left Field Farms was created by a group of like-minded farmers. They only feed their cows non-GMO feed and they can trace their milk back to the farm it came from. It’s simply delicious! All of these flavors are delicious in coffee, chai tea, and even as a substitute for milk in smoothies and baked goods! 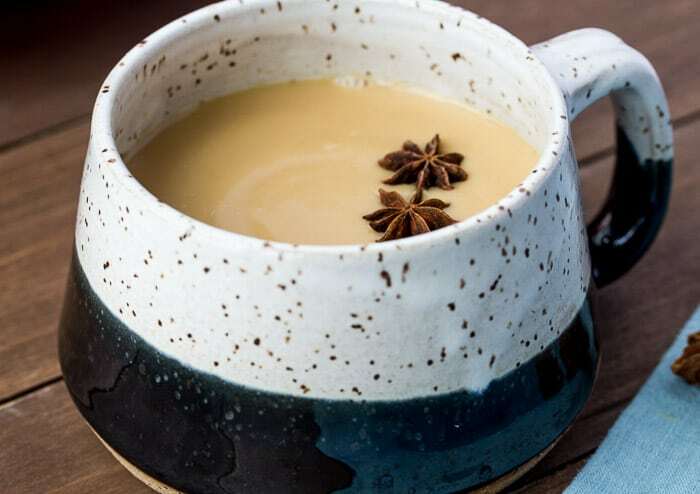 So, how do I make this ridiculously easy Homemade Chai Tea Latte that I keep mentioning? I take 2 chai tea bags and steep them for a good 3-4 minutes in 1.5 Cups of super hot water. I use a high-quality chai tea and prefer it to be strong so the spiciness of it isn’t lost at all. You may want to experiment with how much water you use, how long you let it steep, and which brand of chai tea you like best. Or, you can always make your own chai tea blend! Once the tea is done steeping, I add 2-3 Tablespoons of Left Field Farms Coffee Creamer! Again, you may prefer more or less depending on your own tastes. 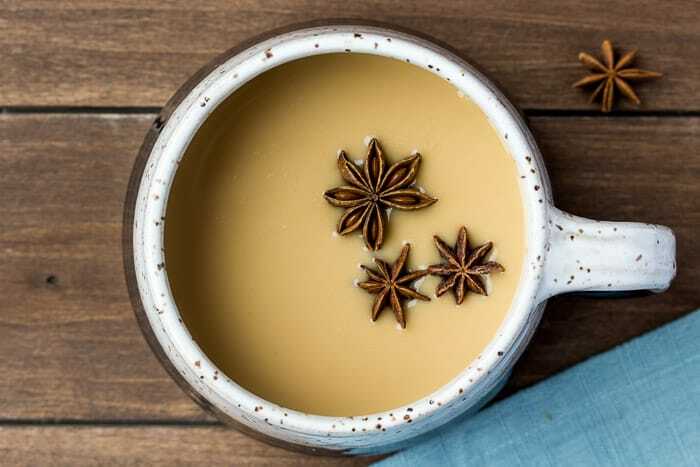 The Sweet & Creamy variety is my go-to for a more traditional Chai Tea Latte or try the Vanilla creamer to transform it into a Vanilla Chai Tea Latte! Stir and enjoy! Crazy simple, right?!? And so so good! 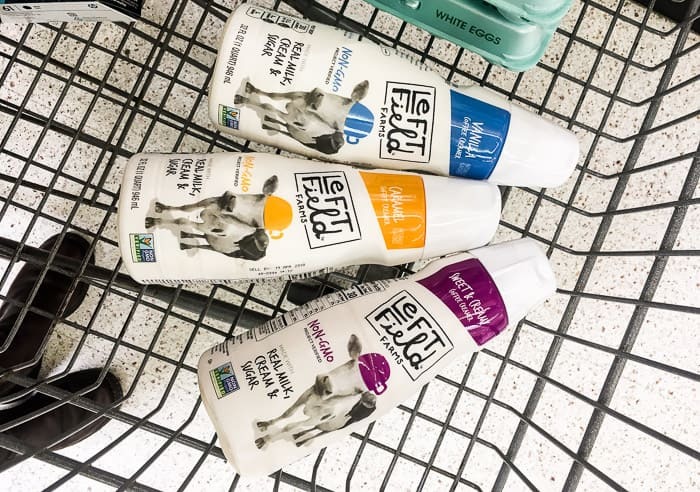 I found all three varieties of Left Field Farms Coffee Creamer in the dairy section of my local Walmart. There is an Ibotta offer as well! 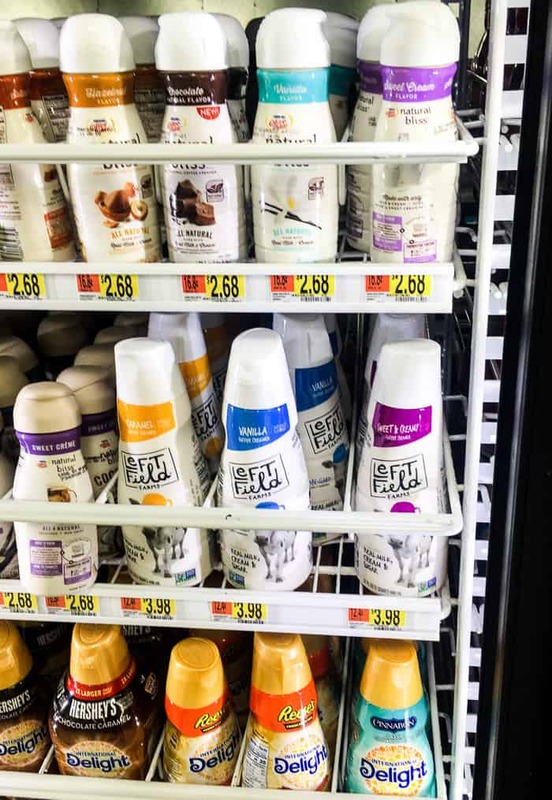 You can earn $0.50 with the purchase of any variety of Left Field Coffee Creamer at your local Walmart! Click here to activate your Ibotta rebate!